Dr. Parhizkar grew up in the Bay Area and completed her undergraduate training at University of California, Berkeley. She obtained her medical degree from University of California, San Diego School of Medicine. 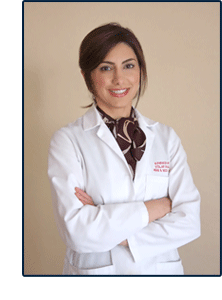 Dr. Parhizkar completed her residency in Otolaryngology at Columbia/Cornell New York Presbyterian Medical Center. She is board certified with the American Board of Otolaryngology. After two years in private practice, she returned to academic medicine for subspecialty training in Pediatric ENT. Dr. Parhizkar completed a comprehensive fellowship in Pediatric ENT at University of Washington, Seattle Children's Hospital. A Bay Area native, she is now back with her husband and son, enjoying the California sun. Dr Parhizkar practices the full gamut of Adult and Pediatric ENT. Her interests include adult sinus disease, snoring and sleep apnea, voice disorders as well as pediatric hearing loss and otologic surgery, congenital malformations (including lymphatic malformations, hemangiomas, cleft lip & palate), obstructive sleep apnea, and pediatric Head and Neck masses. We are excited to provide exceptional quality patient care and look forward to your visit to our office.